In the 18th century, the reformist intentions of the Marquis of Pombal brought to Portugal a considerable number of foreign professors, including Vandelli, who came from Padua. Appointed as professor of Natural History and Chemistry at the University of Coimbra and an active member of several scientific societies, he showed a great dynamism and original ideas. He exchanged correspondence, among others, with the naturalist Linnaeus who, in his honour, assigned the name Vandellia to a species in the Scrophulariaceae family.. 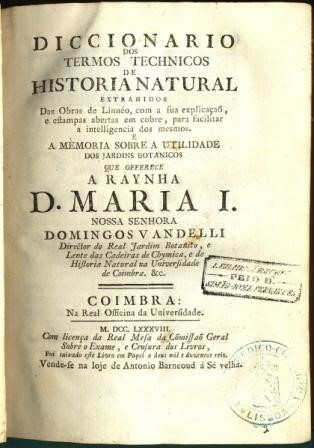 In addition to advancing knowledge on history and natural sciences in Portugal, we were also largely responsible for the creation of the botanical gardens of Ajuda and the University of Coimbra. He also planned scientific discovery journeys, carried out in the late 18th century. He fell into disgrace at the end of his life, for political reasons. Due to his sympathy for the French, following the French invasions occurred between 1807 and 1811 he was accused of being a Francophile and, at the age of 80, deported to the Azores. He died in Lisbon, in 1816. 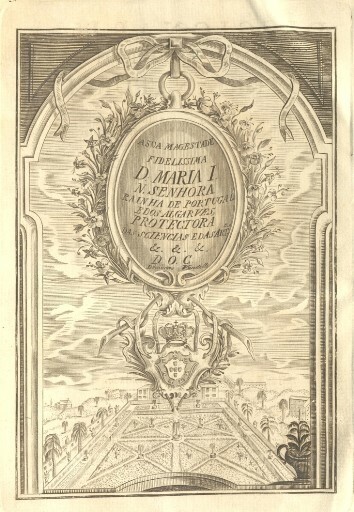 Engraving in the half-title page representing, in the background, the Botanical Garden of the University of Coimbra and, at the top, a dedication to Queen D. Maria I and the coat of arms. The National Digital Library has a full-text version of this work here.